What did we learn from the first day of testing at Sepang? Exactly what we expected to learn. Some riders have adapted quickly, others less quickly. The Michelins have made a big step forward, and the teams have started to understand the Michelin tires better. The spec-electronics still need plenty of work, but are pretty usable in their current form (and well liked by the riders). Yamaha and Ducati have adapted well, Honda not very well at all, with the possible exception of Dani Pedrosa. Above all, we learned that it is too early to be making any judgment calls, and that everyone still has a lot of work to do, and a lot of room for improvement. Today’s outcome is interesting, but not definitive. In other words, if your favorite rider is near the top of the timesheets, you can feel optimistic that they will do well in 2016. If your favorite rider is nearer the bottom, you can console yourself with the fact that there is hope, and that testing will solve the worst of the issues. Testing at Sepang started where the 2015 championship left off: with a Yamaha 1-2. Unlike 2015, however, the first day of testing at Sepang was not even close. 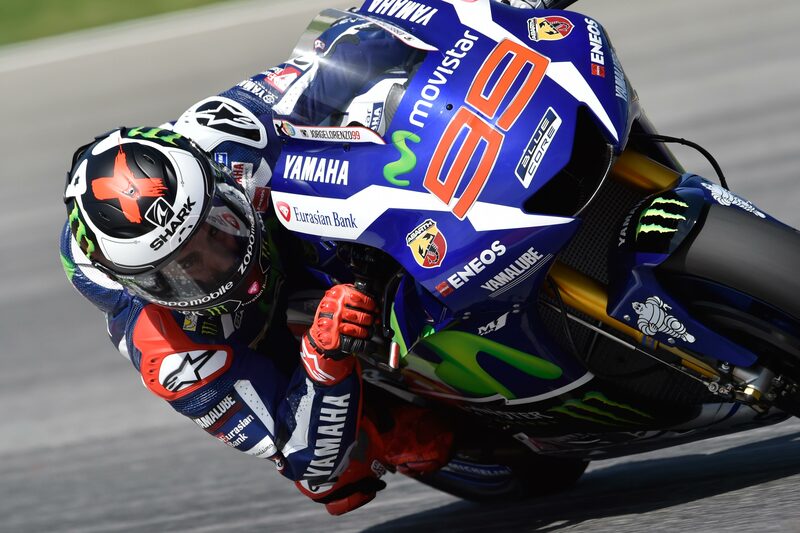 Jorge Lorenzo set the fastest time, well over a second faster than his Movistar Yamaha teammate Valentino Rossi. But it was not just the time which was impressive – just over 0.4 seconds off the fastest time set by Marc Márquez on the first day of the 2015 test – but the outright speed which backed it. While the top five riders – Lorenzo, Rossi, Dani Pedrosa, Danilo Petrucci and Andrea Iannone – all got under the 2’02 mark, Lorenzo had seven laps of 2’01 or faster, where the others only had one each. The Spaniard had managed only two hours on Sunday, and barely got a wink. That is a rather worrying prospect for everyone else at the test. Lorenzo had gotten on well with the spec software, it barely hampering his style. That was less the case for the other Yamaha riders. Rossi may not have been as quick as his teammate Lorenzo, but he too was happy with progress made, especially with the electronics. Yamaha’s engineers had made a big step over the winter, he said, but this was hardly a surprise. Though Yamahas finished first and second, it was the Ducatis which took center stage, with Desmosedicis of various flavors filling the top ten throughout the day. Danilo Petrucci impressed on the Pramac Desmosedici GP15, Hector Barbera was remarkable on the Avintia Desmosedici GP14.2, and Andrea Iannone managed to keep himself near the front of the field all day on the factory Ducati Desmosedici GP15, while also taking the new bike out for a spin. The only downside to the new bike is its name, where Ducati have made a rod for their own back. Because this is 2016, and the Desmosedici has always been named for the number of valves it has (desmo valve operation, plus sedici, the Italian for sixteen), Ducati wanted to do something special. So they have named the bike the Ducati Desmo 16 GP, which left both riders confused as to what to call it. If the riders can’t get the name right, the chances of fans and journalists calling it anything other than the Ducati GP16 are very slim indeed. The upside is that the bike appears to be pretty good, even better than the GP15. Andrea Iannone did not spend much time on the bike, just a few laps, but reported that the feeling was good. He had not spent enough time on the bike to say anything definitive, and had ridden it on different tires to the ones he had used on the GP15, but the first impression was positive. 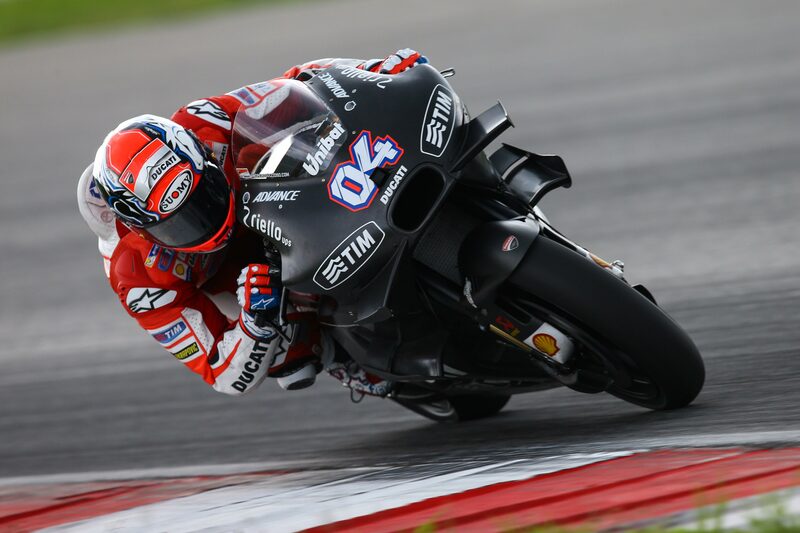 Andrea Dovizioso had spent more time on the GP16, and was impressed at the progress the bike had made over last year’s bike. What do the Yamaha and Ducati have in common? Good power delivery and a user friendly engine, and this is proving to be key to their competitiveness. Honda appears to have failed to learn the lessons of the past, the new engine spec brought to Sepang being only a minor improvement over the engine tried at Valencia and Jerez last year. Both the new engine and the Valencia engine were very aggressive, Márquez’s conceded, but Honda needed to spend time working on the electronics to try to fix that. Dani Pedrosa summed up the problems the new RC213V has. “Basically, braking, entry and exit, we have to make the bike work better,” he said. That is basically a large part of each corner, putting Honda at a big disadvantage. There were issues with the chassis, causing pumping on corner exit, and instability on the brakes into certain corners. It was not a particularly encouraging report from the Repsol Honda men, and only the incredible smoothness of Dani Pedrosa had kept him inside the top three. What is encouraging for Honda is that once you look past Lorenzo, the gaps to the rest of the field were small. 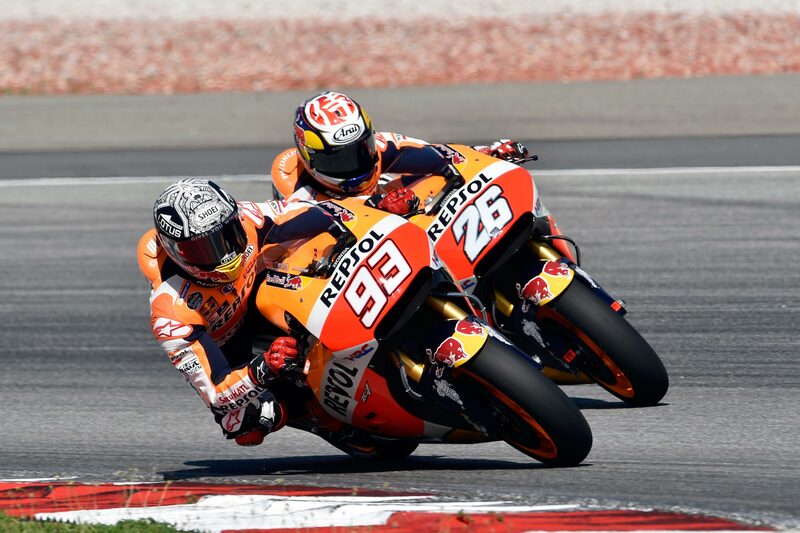 Pedrosa was only 0.063 behind second-place man Valentino Rossi, and Marc Márquez was half a second behind Pedrosa. But the fact that Honda appear once again to have produced an engine that is unrideable without electronics is a worrying idea. Their approach in recent years has been to build an aggressive engine and they try to control it using electronics. That was hard enough with their own proprietary software, with the less sophisticated spec software, that may prove to be a bridge too far. It was a much bigger step than the engine introduced at Barcelona in 2015, which only had a small top end power boost, adding a couple of kilometers per hour in top speed. The engine may have been powerful, but it was also extremely manageable. To test the feeling of the engine, Espargaro rode the new GSX-RR without traction control for most of the day. It was important to be able to compare the new engine to the old one, and that was done best with as little intervention from the electronics as possible. Once Espargaro was satisfied with the new engine, he started to work on dialing in traction control with his team, and immediately started going slower. Espargaro set his fastest lap on a bike with no TC engaged, and went a whole second slower once he turned it on. That is a much easier problem to fix than the opposite. If fans had been looking forward to Monday, they are watering at the mouth at the prospect of Tuesday. 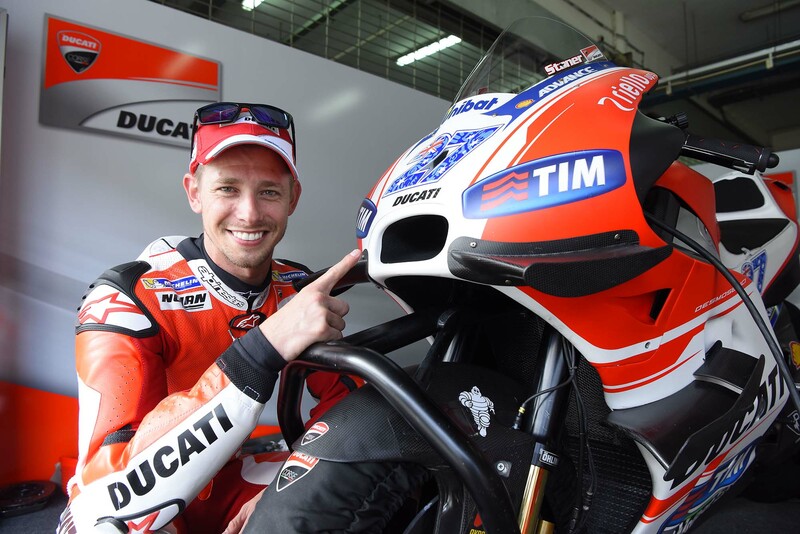 Casey Stoner is due to take to the track as part of Ducati’s test program on Tuesday, and will be riding on track as MotoGP’s current Aliens – Valentino Rossi, Dani Pedrosa, Marc Márquez and Jorge Lorenzo – for the very first time. The comparisons with Stoner’s time from Saturday were tenuous, because of the differing conditions at the track, Stoner’s 2’02.1 set on an empty and dirty track, while the weather was hotter on Monday. On Tuesday, the fantastic five all take to the track for the first time, allowing direct comparisons. How will Stoner do? Jorge Lorenzo believed that the Australian would quickly be up to speed. “I think he can be in the top three,” the reigning world champion predicted. “He always liked Sepang and he has had the same days as us so he can be very fast.” Tomorrow, we see what Lorenzo’s predictions are worth.